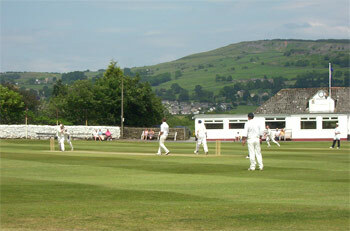 Established in 1867, Denholme CC is a local community village cricket club that welcomes players of all ages & abilities. We have a 1st & 2nd XI who play on Saturday afternoons in the Mewies Solicitors Craven & District Cricket League. The 1st XI currently play in Division 1 & the 2nd XI play in Division 3. We also have a mid-week team who play on Wednesday evenings in Division 1 of the Bradford & District Evening League. We currently have 3 junior teams at Under 15's, Under 13's & Under 9's in the junior leagues organised by the Upper Airedale Junior Cricket Association. We have previously run junior teams at all age groups & will continue to do so again in the future subject to the availability of players & helpers – it’s great to see the youngsters coming through the ranks into the senior sides. We are also currently in the process of working towards attaining ECB Clubmark accreditation. Situated on Keighley Road in the rural setting of Denholme village itself (post code BD13 4JT), our ground boasts stunning views & famous high quality cricket teas. We are always delighted to welcome new faces to the club, whether they be junior or senior players, helpers, committee members, sponsors, volunteers, etc, in fact anyone who would like to play a part in ensuring that our local community cricket club continues to fulfil it's important role within the structure of village life in Denholme & providing people of all ages with the opportunity to play the great sport of cricket.